Crimson clover. Consider planting a cover crop to suppress weeds and add nutrients to your garden over the winter. Photo courtesy of shannonm75 via Creative Commons License. 1. Plant trees, shrubs, perennials, ground covers and more. Read our previous post for tips on how to plant trees properly. 2. Weed, weed and weed. 3. Putting the vegetable garden to bed, unless of course you’ve planted winter crops. 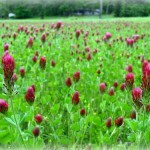 If not, consider planting a cover crop such as crimson clover to suppress weeds over the winter and improve your soil. 3. Time to plant spring-flowering bulbs, such as tulips, daffodils and hyacinths. Get the earliest bloomers into the ground first: cocus, daffodils, tulips and hyacinths. The bulbs will need need several months of winter chill to produce good springtime blooms. 4. Remove dead and diseased leaves, plants and other messes from around your landscape to reduce diseases next year. Deadhead flowers. 5. Continue to plant or transplant perennials, shrubs and trees. Winter months provide ideal conditions for planting new shrubs and trees. 6. Plant garlic for harvest in the spring. 7. Turn off irrigation system once the rains come.